The Simpsons Movie might be the most lucrative deal this summer, being a simple 2D cartoon with only primary colors (still a budget of about $65 million though), but earning it all right back in the first week of release. With an opening weekend of $74 million, you can buy enough donuts and beer for Homer to last for a few decades. The somewhat weak comedy I Now Pronounce You Chuck and Larry, still manages a second place in its second week, bringing in $19.1 million. Following the 3 and 4 place is Harry Potter and the Order of the Phoenix and Hairspray, both dropping one spot with resp. $17.7 million and 15.9 million. Rounding out the top 5 is the second new release of this week, Catherine Zeta-Jones and Aaron Eckhart starrer No Reservations. With $11.7 million, they just might have benefitted from calling ahead anyway (though they’ll probably recover from their $28 million budget before the movie ends its run). With a less than stellar start in 2005, my expectations weren’t that high for this sequel. So things I didn’t expect, like character development and a smart story, weren’t there to be again. What was there, was another fast-paced story, filled with funny bits and acceptable special effects extravaganza. And without boredom, there’s no time to wonder about the simplicity of the whole, and you just keep sticking pop-corn in your mouth. In that sense, it’s another success, still not fantastic, but pretty good.7Â½. The trailer will show this movie isn’t one of the best in its league, and so the movie follows the same trend. Just basically a simple story filled with the most easy jokes around, from mediocre vulgar slang, to predictable gay-tinted dialogue. Direction isn’t the best I’ve seen either, rushing through scenes, fitting as many weak jokes in the roughly 100 minutes as possible. The preachy nature, and the misplaced sentiment during the end finishes it off, enough to sigh and just forget about the whole ordeal ever existed (especially an extremely unfunny Rob Schneider, but then again, Steve Buscemi was pretty funny).4-. While the new book is breaking the fastest selling record, the boy wizard loses his box office magic juice a little bit faster than his rival hardware friends. This means a new comedy entry takes over the top spot already. I Now Pronounce You Chuck and Larry, starring Adam Sandler and Kevin James as two straight people pretending to be gay lovers, hauls in $34.8 million, just a few points lower than Sandler previous hits (for instance, Click opened at $40 million). This leaves Harry Potter at two, dropping some 58% (compared to just 47% for Transformers last week), but still has enough power left to conjure some $32 million (and a total racing past the $200 million mark). Hairspray, the musical starring John Travolta as a big fat momma, scores $27.8 million. Dropping to number 4, but still on a destructive path is Transformers, with $20.5 million and a $263 million total. Rounding out the top 5 is Ratatouille with $11 million and a total of $165 million, coming a whole lot short of Brad Bird’s previous achievement with The Incredibles ($200+ at the same week of release) despite extremely favorable reviews. Frank Oz is a bit of everything. He’s the voice of Yoda, but also from many Muppets (including puppeteering them himself). He’s a director too, with memorable comedies in the late eighties, till the more mediocre stuff in the late nineties (In & Out, Bowfinger). This time, he’s directing a movie a bit in the British style. The title of this movie is perfectly descriptive, and hence, there’s no need to predict what is going to happen. That’s one side of the story, as there are many many things you will see coming before it happens, but still laugh out loud about it. The other hand is the unpredictability of it all, and all of it happens only at one location (where the funeral is being held). While slow at first, the escelation of the little problems run rampage after less than 20 minutes, and keeps on going till the end. I guess Frank Oz is definitely back in the game, if he keeps making comedies like he’s never done before.8. Of their past albums, I’ve selected less than a handful of songs, and this album is no difference. Most of the songs I can dispatch to the dislike-bin with mere seconds of listening. Others I give several tries, but to no avail. Those songs just seem to be missing that magic to make it a hit. I know they’re able to make some hits (though never impressing with originality), but they keep using the same template for their songs, and that can’t be good in the long run. With only a moderately capable voice, you need to excel with your music and lyrics, and frankly, they don’t. I think, now already at their 4th album, they’re definitely going downhill, from being too generic to no hit potential at all.4. Wow, look at this recent study about criminal profiling in this lil’ country. The only relevant line in this report is actually this: “Aziaten komen verhoudingsgewijs weinig in aanraking met justitie. “. It just means, my mob cousins are doing their work at an efficient and ninja-stealthy like manner. Way to go, cous’. Somehow Fox deemed this mediocre performing sit-com salvagable for a summer run, but tweaking the formula wasn’t such a good idea. While a fastpaced funny in its first inception, it now is nothing more than dreary repetition. Philip Baker Hall’s unpredictable wacky character keeps you on your toes, the irritating brother character, and the lack of hot females (both girls from season 1 were axed) makes this a series not worth watching even during the low-key summer months. Harry Potter does his magic again at the box office, breaking a few records along the way. With $77.1 million take for the weekend, the total already stands at $139.7 million since its Wednesday wide opening. Transformers did their record breaking last week, and they’re still on course for a fabulous ride, this week with $37 million and a grand total of $224 million. Leftovers round out the top 5, respectively Ratatouille with $18 million, Live Free or Die Hard with $11.3 million (the total just passed $100 million mark) and License to Wed with $7.3 milion. A surprise hit States-side (they thought it would appeal only to the older males who grew up with the toys and cartoon series), it actually plays well in most demographics. And it’s quite understandable. Michael Bay really delivers the ultimate pop-corn movie here. It’s an uncomplicated story, but the rest will blow your mind. Sometimes, with a high budget movie, you wonder where all the money went to, but with this $150 million vehicle, it’s quite clear. Wonderful location shooting and stunning visuals (though a bit fast cut and chaotic at times) are a force to be reckoned with, but most of the characters have fantastic one-liners, and Shia LaBeouf carries this movie well on his own. Still, there are also quite a bit of memorable other characters around (hilarious roles for John Turturro and Anthony Anderson), and not the least the Autobots themselves. Another important factor well done is the sound design (mostly effects), though Michael Bay’s recent go-to composer Steve Jablonsky delivers a not-so imaginitive score (resembling too much of his own previous works and his learning master Hans Zimmer). All in all, this movie is not only enjoyable in the short run, you’ll actually wanna go out and buy the newly produced Transformers toyline (now even more advanced), and play with it like the good ol’ days till the highly probable sequel comes out in two years.8Â½. USA Network is definitely back for the summer months. While their new show Burn Notice may smolder away under a dark moldy rock, these private detective duo pairs up for a good solid two hours of belly-aching laughter. Both new episodes seem to be injected with a vacation inspired fresh can of ideas and guest stars, and it looks like it’s going to be another set of excellent seasons. As the books fly off the shelf, it’s only a short wait for the movie version, and I’m glad yet again for not reading this book. Yeah, people will say the books are better, but I still fail to see how several directors get to reduce good books to mediocre movies. The theory that the books are not so good to begin with is so much more feasible. Already the fifth of the series, it’s doing quite a good job at lower expectations for the next chapter. This movie shows nothing new. Not in story, but also not on screen. Hiring a conventional TV director must have been a part of the equation, as there are no stunning visuals, or inventive camera work to be seen. The story doesn’t feel like an adventure, and most characters are reduced to cameos. With the focus on Harry Potter, the inner struggle hasn’t changed, and hence, it utterly feels like a rehash of the previous movies. Not only that, with the darker visual texture, it’s still brightly clear this is a kiddy picture, with themes repeating themselves in a non-daring way. With only two more to go, I think I’m qualified enough to blame this cowardly trend not mainly on the directors, but on JK Rowling herself.6+. High-tech box office record breaker this week, as The Transformers charge their ways to the top spot with $67.6 million, and already a total of a whopping $152.5 million (since that started showing up on Tuesdays already). Ratatouille isn’t beaten down easily though, at two with $29 million and a total of $109.5 million. Live Free or Die Hard has to do with a spot lower, $17.4 million and a total of $84.2 million. A second new entry at 4, Robin Williams starrer License to Wed has a $10.4 million ceremony, and might be considered a flop. Evan Almighty drops to the fifth spot, with $8.1 million and a $78.1 million total, it IS definitely a flop (considering $175 million budget). A new series on the USA network, where the slogan is “characters welcome”, this show is quite devoid of it. Of course, they have characters, just not very defined or memorable ones. While being in the crime game is bad enough, it just doesn’t stand out anymore (and certainly not like the other USA network shows Monk or Psych does). Basically it’s about a spy who’s disavowed for unknown reasons, is left with no resources anymore, and tries to find out who are what is behind it. Seems like a good story line to finish throughout the season, but sadly, it all comes off pretty dull and boring. Usually I give new shows at least 2 episodes to try out, but I’ll leave it at this pilot for this one. After expanding their excellent crispy chips line with some light versions, they’re expanding once again. 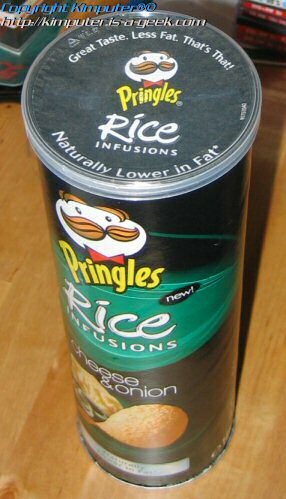 This time it’s their Rice Infusion series, which may or may not surprise you, infuses rice into their usual Pringles mix, making the chips absorb 30% less fat. Flavors coming out will all be the same as the regular Pringles, so taste-wise, you know what to expect. The base, however, has changed a tiny bit (and with that, only a tad of the flavor), and you’ll notice it mostly on the much denser texture. The rice makes the chips harder and you have to chew a little bit more. So, for the weight watchers out there, you can eat more now ! For the rest of us, just stick with the regular series. You are currently browsing the Kimputer's Weblog weblog archives for July, 2007.